After every game is completed a coach from either of the competing teams should enter the score of the game into the SI Play system. Whether the game counts in the team standings or not, the score should be recorded. Games with recorded score will be concidered completed games. If a completed game is not intended to count towards the team standings, the game is marked as such on the schedule; an entered score will not effect the team standings. Rookie coaches should enter the score 0-0 for a completed game so that it is identified the game was played and completed. It is the responsibility of the head coach of the home team to ensure the score is recorded for a contest. Any coach of either team may enter the score, but the head coach of the home team is responsible to ensure the score is entered correctly. If the score was entered incorrectly, the coach is able to update the score using the same process. In the event the coaches do not agree upon the final score, consult the league's commissioner by email with the address found on the contact page. 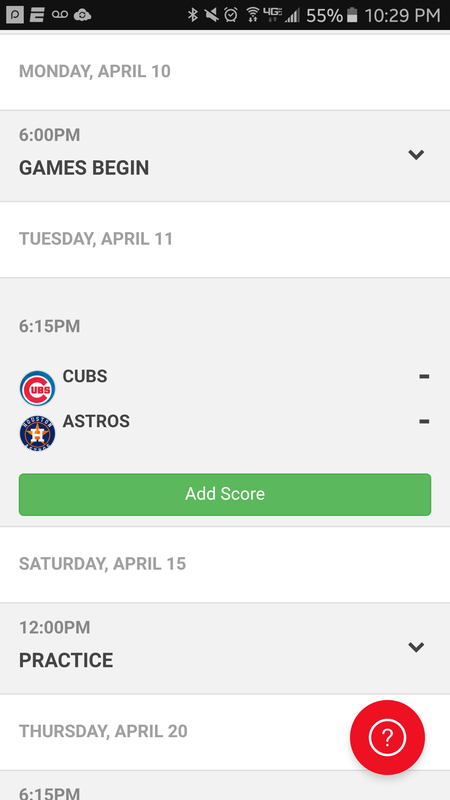 On your team schedule, find the game and select the game to open it and display the game details. From the game menu, select "Live"
If the game time has past, the game will be listed as completed and a three-dot menu is available on the right, select the menu and select "Edit Score"
Enter the score for both teams and select "Save"